"Roget" redirects here. For other uses, see Roget (disambiguation). Peter Mark Roget LRCP FRS FRCP FGS FRAS (UK: /ˈrɒʒeɪ/ US: /roʊˈʒeɪ/; 18 January 1779 – 12 September 1869) was a British physician, natural theologian and lexicographer. He is best known for publishing, in 1852, the Thesaurus of English Words and Phrases, a classified collection of related words. Peter Mark Roget was born in London. His obsession with list-making as a coping mechanism was well established by the time he was eight years old. The son of a Swiss clergyman, Roget studied medicine at the University of Edinburgh, graduating in 1798. His life was marked by several depressing incidents. His father and his wife died young; while his beloved maternal uncle Samuel Romilly committed suicide in his presence. Roget struggled with depression for most of his life; his work on the thesaurus arose partly from an effort to battle it. Roget retired from professional life in 1840, and in about 1848 began preparing for publication the one work that was to perpetuate his memory. This was the catalogue of words organized by their meanings, the compilation of which had been an avocation since 1805. Its first printed edition, in 1852, was called Thesaurus of English Words and Phrases Classified and Arranged so as to Facilitate the Expression of Ideas and Assist in Literary Composition. During his lifetime the work had twenty-eight printings; after his death it was revised and expanded by his son, John Lewis Roget (1828–1908), and later by John's son, Samuel Romilly Roget (1875–?). 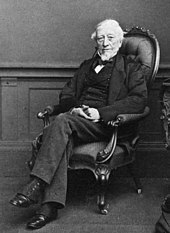 Peter Roget was a secretary of the Portico Library in Manchester and it was there that he began to compile his Thesaurus. Roget died while on holiday in West Malvern, Worcestershire, aged 90, and is buried there in the cemetery of St James's Church. Roget was much concerned with medical education but the School of Medicine at the University of Manchester was only established in 1874. He was also one of the founders of the Medical and Chirurgical Society of London, which later became the Royal Society of Medicine, and he was a secretary of the Royal Society. In 1815, he invented the log-log slide rule, allowing a person to perform exponential and root calculations simply. This was especially helpful for calculations involving fractional powers and roots. In 1834 he became the first Fullerian Professor of Physiology at the Royal Institution. He was an examiner in physiology at the University of London. On 9 December 1824, Roget presented a paper entitled Explanation of an optical deception in the appearance of the spokes of a wheel when seen through vertical apertures. This article is often incorrectly referenced as either On the Persistence of Vision with Regard to Human Motion or Persistence of Vision with regard to Moving Objects, likely due to erroneous citations by film historians Terry Ramsaye and Arthur Knight (see Anderson and Anderson below). While Roget's explanation of the illusion was probably wrong, his consideration of the illusion of motion is seen as an important point in the history of film, and possibly influenced the development of the thaumatrope, the phenakistiscope and the zoetrope. He played an important role in the establishment of the University of London; he was a founder of the Society for the Diffusion of Useful Knowledge and wrote for it a series of popular manuals. He showed remarkable ingenuity in inventing and solving chess problems and designed an inexpensive pocket chessboard. Canadian writer Keath Fraser published a story, "Roget's Thesaurus," in 1982, which is narrated in Roget's voice. Minimalist in style, Fraser's story manages to capture both the associative power of language and many of the salient facts of Roget's life in a text that occupies less than two full pages. A picture book biography of Roget entitled The Right Word: Roget and His Thesaurus was published by Eerdmans Books in 2014. It was named a Caldecott Honor book for excellence in illustration and won the Sibert Medal for excellence in children's nonfiction. Roget was the focus of Randy Wyatt's "Synonymy", which premiered at Minnesota State University's Department of Theatre and Dance in December 2005. In the play, Gordon, a graduate student, rents Roget's last known residence to inspire himself as he writes his dissertation on the English language and Roget's Thesaurus. The building, soon to be torn down, creates a gateway through which Gordon finds himself traveling back in time and meeting Roget and his daughter, Kate. Roget also appears in Shelagh Stephenson's An Experiment with an Air Pump, which concerns scientific ethics. The play takes place in the household of Joseph Fenwick in 1799, and Roget is one of Fenwick's assistants. 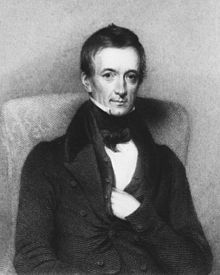 Roget was elected a Fellow of the Royal Society in 1815. Treatises on Electricity, Galvanism, Magnetism, and Electro-magnetism. London: Baldwin and Cradock. 1832. LCCN 08007072. Animal and Vegetable Physiology Considered with Reference to Natural Theology. Bridgewater Treatises. I–II. London: William Pickering. 2009 . ISBN 9781108000086. LCCN 06011266. Thesaurus of English Words and Phrases (Fourth ed.). London: Longman, Brown, Green, and Longmans. 1856. ^ Mallon, Thomas (16 March 2008). "Obsessed (Agog, Beset, Consumed, Driven, etc.)". The New York Times. Retrieved 4 May 2008. ^ Spiegelman, Arthur (28 March 2008). "The man who made lists to fend off depression". Reuters. Retrieved 4 May 2008. ^ Lemco, I. "Roget's Engineering Successor [i.e. S. R. Roget]". Retrieved 18 October 2009. ^ West, The Brain Bank North (5 October 2014). "A Scientist by Any Other Name…". The Brain Bank North West. Retrieved 1 February 2019. ^ Deaths England and Wales 1837–1983 – lists place of death as Ledbury, and expands "The district Ledbury spans the boundaries of the counties of Herefordshire, Hereford and Worcester and Worcestershire"
^ "Obituary – Dr. Roget, F.R.S". Medical Times and Gazette. London: John Churchill and Sons: 395. 25 September 1869. ^ Kendall, J. (2008). The Man Who Made Lists. G.P. Putnam's Sons. ISBN 9780399154621. ^ Roget, Peter Mark (1824). "Explanation of an optical deception in the appearance of the spokes of a wheel when seen through vertical apertures". Anderson, John; Anderson, Barbara (1993). "The Myth of Persistence of Vision Revisited". Journal of Film and Video. 45 (1): 2–12. Anderson, John; Fisher, Barbara (1978). "The Myth of Persistence of Vision". Journal of the University Film Association. 30 (4): 3–8. Emblen, Donald Lewis (1970). Peter Mark Roget: the word and the man. London: Longman. ISBN 978-0582108271. Kendall, Joshua (2008). The Man Who Made Lists: love, death, madness, and the creation of "Roget's Thesaurus". New York: G. P. Putnam's Sons. ISBN 9780399154621. Wikimedia Commons has media related to Peter Mark Roget.